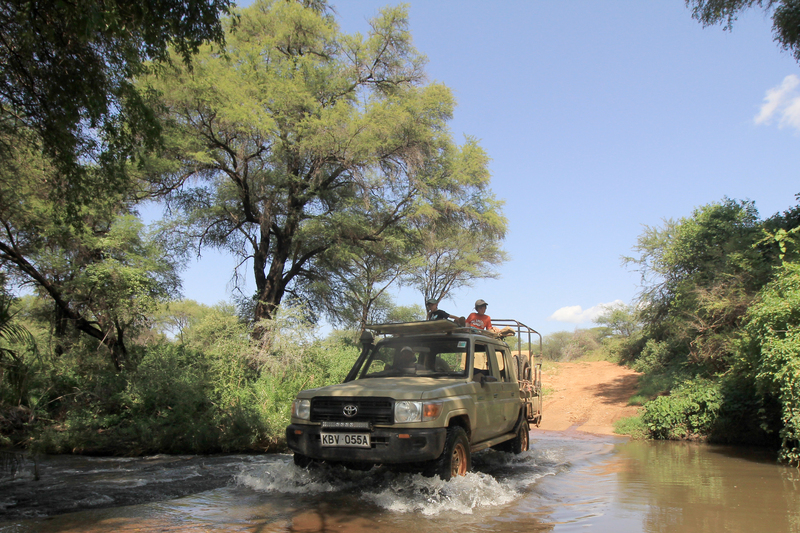 Laikipia Wilderness is a great family safari destination because for 20 years we have specialised in hosting families and our camp has a huge range of adventurous activities which engage families. We love keeping everyone busy and excited and aim to create life-long family memories. This is a really important holiday as a safari can be an incredible bonding experience, leaving behind the gadgets of the modern world and surrounding ourselves in nature and adventure. Our guides all have children and Kenyans are very warm, family minded people and delightful hosts. Catfish rescue – when the dams dry up in the dry season we try and release the catfish into bigger dams or the river. Catching them is not a clean process! Our children are at school in Nanyuki but spend most weekends and most of the holidays in the camp and we love having children to stay. Children of any age are welcome, though it can be tiring so we recommend 4 and above. We have been nominated one the of top ten family holiday specialists in the world by Conde Nast, and for many years have designed activities to suit families and keep everyone excited. We are also extremely flexible which is essential, and no day is exactly the same, all activities are designed to suit individual groups as everyone is different! We LOVE having families on safari and specialize in this area. We have won awards for best family safaris in Africa and bringing up our own family in the bush has been the greatest privilege so watching others enjoy this is hugely rewarding. Our activities are perfect for families. Children do not want to sit in a vehicle for hours on end and whilst your wish list may be to see lots of wildlife, we have found that they are more interested in getting out of the car and doing things! River rope swing – swing into the river from a rope Tarzan style. Parents too! All of our activities apart from cooking, painting and archery require parental supervision. Please bring your own flotation devices for children who cannot swim if they want to swim. Can children have separate meal times ? Yes they can and we have designed a routine that works! From experience and lots of practice, what works really well is normal meal times for breakfast and brunch, then for smaller kids (ie under 8) dinner is packed with the sundowners and eaten at around 6.30 whilst out on a game drive. Then if they fall asleep in the car on the way home it doesn’t matter as they have eaten and everyone is happy! We are used to catering for kids as our own kids have grown up in the camp. Smaller kids’ picnic dinner on the game drive tends to be pasta shells, chicken strips and potatoes, fish strips and chips, mini burgers, sausage rolls, and lots of raw vegetable sticks. If kids are fussy we ask the parents what DO they eat and then make it! It’s much easier that way. Otherwise all other meals like brunch are family friendly, lots of pizza, salads, burgers, breads, wraps and fresh crunchy salads from the garden. Is babysitting/listening service available? Yes. We have staff who listen out for any movement or noise, and also have room ladies who can babysit and sit outside the kids’ tent whilst the parents are having dinner. If kids want to be nearby they can come and lie on a sofa in the dining area whilst the parents are having dinner, just outside around the fire on the veranda. We just ask that you respect the needs of adult travelers and that this is their holiday too. Every effort is made to accommodate everyone but parents are still responsible for ensuring their children are well behaved and do not make too much noise at shared meals. I love it when we have kids to stay on safari. There are so many fun things to do in the bush and its boring doing them on your own! So when we have guests to stay with kids they get really excited. There are lots of animals like lions and elephants but they mostly get excited to do fun stuff like looking for scorpions with our special scorpion torch. It makes them glow in the dark at night. We always have to have grown ups with us and you have to be really careful so we are not allowed to pick up stones ourselves in case you get stung. My dad got stung once and went crazy it was so sore. We had to stick his hand in an ice-bucket and feed him whisky and a lot of pills! So we are extra careful! We have this really cool rope swing down on the river and we take people there to swing into the river. Joseph climbed up the highest tree with the rope to hang it on a branch. It is so high! But he is used to it as he is a Samburu honey collector. When he sees bees he goes mad! Then he follows them to their hive and gets the honey out. He doesn’t even mind getting stung. I have my own bee hives now but I have a bee suit and we bought one for Santeria who is the guy who helps me. He smokes the bees out with burning grass and sticks. Fly-camping is really fun. So we go out into the bush, the best place is this valley where there a lot of owls and leopards. The campsite is a bit open, and underneath it is a small dry river and thick bush full of animals. We cook beef fillet on the fire (sometimes I tell people it’s a puff-adder as it looks like a fat snake!) and then we sleep on bedrolls around the fire. You have to have a rifle with you in case something comes close in the night and we park the car next to us and put chairs around us to make a barrier. We take our dogs with us and they sleep on the bedrolls. Some people sleep in see through tents, you can see the stars through them. Its really exciting but its pretty safe. You hear hyenas and lions at night, and sometimes a buffalo making a grunting noise. That is an alarm call, like when they have seen something like a lion or a leopard. If you are lucky you might see a snake on safari. If it’s a harmless snake like a spotted bush snake or a striped sand snake, we can catch it and you can touch it. If you are really brave you can hold it. If you move fast you scare them, so its best to move slowly. We go rafting in the river when it has rained and its high enough. Sometimes you go past animals but we always get out before you reach a hippo pool. You can also go tubing in the river. Sometimes Boris comes in the raft with us! He is huge, he weighs 40 kg. He loves going down rapids! We also jump off rocks into the pool by the waterfalls. Its really deep. We have a foofy slide, it’s a cable you set up over that pool and its tied to a tree at each end but my mum doesn’t let us use it for guests! Only friends like on our birthdays. You have to let go over the pool before you get to the other side otherwise you end up in a tree. This is my house. Its made of chicken wire and mud and has a tin roof. Its really noisy when it rains. We have funny pets at the camp like the vulturine guinea fowls. They got so tame they would come in the house and watch TV or in the kitchen and drive Godfrey mad (the cook). They went wild when they met a wild flock and made friends with them slowly. My brother and I both love art. My mum does too, and her sister is a professional painter. My mum told her she had to get a proper job when she left university as its really hard being an artist. So she did and she hated it so much she started working as an artist and now she earns much more money than her proper job! Rafe and I like painting flowers, hills, and mostly birds. It helps you learn about birds if you paint them as you remember the colour of all their different feathers. This is my older brother Tristan. We get into trouble for raiding the storeroom and eating things in the fridge that are meant for the guests like left-overs. My mum goes mad and so does Godfrey the chef. My mum says it won’t be long before we are raiding the booze and then we will be in real trouble. I love wild dogs. They aren’t scary and you can get really close to them. Recently a lot of them died as they got a disease called canine distemper but some packs have been seen around not far from us and they like our area because of the thick bush. It’s the best place to hunt dik-diks so we think a new pack will form and come and live in our area again soon. Once one of them sniffed my foot. Their puppies are so cute. This is our pet owl. He was a greyish eagle owl and his nest got raided and we found him in a dry river bed. He was really tame and used to sit in people’s bathrooms and sometimes they were a bit embarrassed to go to the loo! One lady complained that her sister had an owl in her bathroom and she didn’t and it wasn’t fair! He used to jump on the computer and delete everything and play with the keys! He slowly went back to the wild and stopped flying home for food and started catching his own prey slowly until one day he was gone. So its sad when they leave but you are happy that they have gone back to the wild successfully. Fishing is really fun and we go fishing with lots of kids who come and stay at the camp. Sometimes you catch tilapia which are really tasty but mostly catfish. We do lots of fishing in Meru too, and you can catch a lot of tilapia but there are crocodiles there so you have to be careful where you are stand. This is a Golden Orb Spider. Its web is stronger than steel! They are huge and scary looking but harmless. Photography is really cool and lots of kids enjoy taking pictures of animals even if they haven’t ever don’t it before. Rafe and I take a lot of bird photos for our art so then we can copy them. My Saddle-billed Stork (top one) and king fishers by Rafe. Cowie is our pet calf. We rescued him during the drought this year. He was so thin he couldn’t walk and keep up with is herd so he was left behind and wandered into the camp. We fed him grass and rice and he is really fat now and so tame you can climb on his back. We have family tents so kids can share with their parents. Their parents go in the double tent and then there is a smaller tent attached to the side of that tent with two beds in it. A third bed can be put in the double tent for families with three kids. They all share one bathroom. The bathrooms are pretty big. You can swing a leopard in them. Our owl used to sit on the bathroom walls and watch people in the bathroom. He even got in the shower with one of the guests and showered next to her, that was so funny. We have early dinner for younger kids in the car. So when the guests go for an evening game drive, they can take sundowners and a takeaway kids supper in Tupperware boxes like chicken strips and chips and raw vegetables. Or sausages and rolls and vegetables. Or pasta, whatever they like really. Then if the small kids fall asleep in the car on the way home they can be carried straight to bed. We also have people who can stay near their tents whilst the grown ups are having dinner so if they wake up they can call their parents. But normally they sleep really well as we are so busy during the day and there is so much to do.